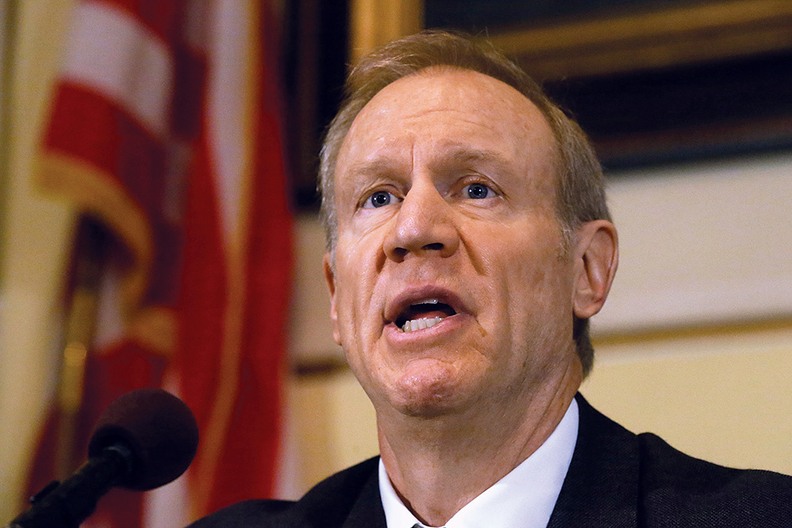 The Rauner administration has cut off Blue Cross & Blue Shield of Illinois from enrolling patients in the state's revamped Medicaid managed-care program, a blow to the dominant insurer. The Illinois Department of Healthcare & Family Services, which oversees Medicaid, stopped enrollment to Blue Cross on April 11 and imposed a $150,000 fine, according to recent letters between HFS and Blue Cross. HFS levied the penalties for two reasons: Blue Cross' network of doctors and hospitals around the state doesn't provide enough access for patients, and the Chicago-based insurer failed to address a backlog of grievances and appeals from its enrollees. "Our priority is to provide the highest levels of service to our members, providers and the Illinois Department of Health & Family Services," Blue Cross spokeswoman Colleen Miller said in a statement. The insurer "is committed to making the necessary investments and improvements in technology, process, staffing and training to provide long-term solutions to meet the needs of all our (Medicaid) members." The enrollment suspension comes at an inconvenient time. Medicaid recipients are choosing among seven insurers depending on where they live in Illinois—Blue Cross has enrolled the most so far—as part of Gov. Bruce Rauner's new managed-care program. He's largely privatizing the state health insurance program for the poor and disabled by having private insurers oversee Medicaid recipients' medical benefits, with a focus on prevention. The idea is to improve the health of Illinois' roughly 3 million Medicaid enrollees, ultimately lowering medical costs and saving the state money. The overhauled managed-care program, dubbed HealthChoice Illinois, debuted Jan. 1 and rolled out statewide as of April 1. Medicaid recipients can pick their insurer. If they don't, the state will assign them to one. That's where Blue Cross just lost part of its ability to compete for enrollees. As of March 1, Blue Cross enrolled about 432,000 people, followed by regional carrier Meridian Health Plan (nearly 429,000), and CountyCare (nearly 329,000), which is owned and operated by the Cook County Health & Hospitals System, state enrollment data show. The healthcare and family services department warned Blue Cross in January that the state would stop assigning patients to the insurer April 1. Blue Cross' network of hospitals, specialists and primary care doctors in the northwest, central and southern parts of the state was lacking, according to a March 21 letter from HFS to Blue Cross. In separate correspondence, HFS outlined how the department told Blue Cross in February that the insurer needed to complete old appeals and grievances by March 15. Blue Cross turned in reports March 29 and April 2, but they appeared to be different, "leading to questions about the accuracy of the data in the reports." The letter didn't provide details of the age or types of appeals and grievances, and a spokesman for HFS didn't have immediate details. The state also recently sanctioned Blue Cross in a separate Medicaid program, fining the insurer $87,500 related to processing appeals and grievances. "The non-compliance is egregious, persistent, and incapable of being cured retroactively," HFS wrote in an April 6 letter to Blue Cross. Still, the financial penalty isn't much of a deterrent. Blue Cross' parent, Health Care Service Corp., one of the largest insurers in the nation, had $32.6 billion in 2017 revenue, according to a financial statement. That represents a majority of HCSC's business. "Rauner stops sending Medicaid patients to Blue Cross" originally appeared in Crain's Chicago Business.